Cacharel Catch Me is a fragrance for those who are not afraid to challenge life. 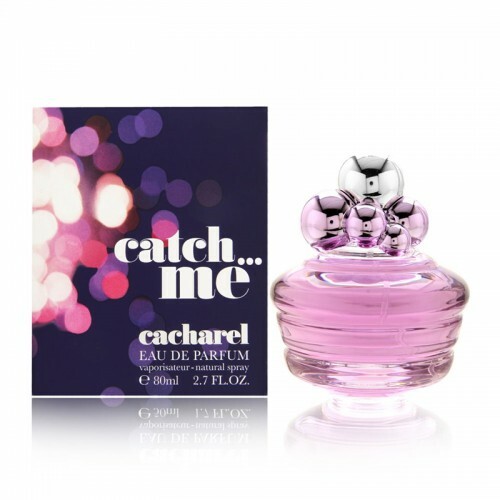 Cacharel Catch Me 80ml. Eau De Parfum is the lively and playful fragrance that was launched in 2012. The perfumed water Cacharel is flirty, youthful and develops into a rich scent of spicy citrus and gourmet flowers. After swinging, it turns into shimmering tones of Italian mandarin and fresh oranges. The heart of the fragrance is formed by heady orange flowers from Morocco that mix with the tones of narcotic jasmine. The individual fragrance compositions are based on almond milk, amber and woody tones. Cacharel Catch Flower Scent ... I will be tempted by a hot summer romance and flirting. Light scented water will get you and will not let you out of your captivity. It perfectly describes the true essence of femininity and transforms you into a seduce, which all men easily succumb to. The romantic scent will be your inherent part of day and night! Relatively recently released perfume Cacharel Catch Me immediately attracted the attention of many women. The reason is that the entire composition of this product corresponds to the claimed name. Final notes really captivate the men, so act on the male attention amber and musk, talentedly connected by wood chords. But the fact that the allusion to temptation did not look too frank and that intrigue was preserved, there are other notes in the composition. In a heartfelt note of perfume you will hear a real garden, here it blossoms Italian white jasmine and a bush of Tunisian orange. Floral aromas envelop the girl with a gentle charm and emphasize her natural beauty. In the composition you can also find citrus notes, these are echoes of juicy mandarin and sweet and sour petitgrain. Perfume Cacharel Catch Me is created for those beautiful girls who have exactly decided to conquer their object of passion and know that they will succeed.